Today I was sucked into an Facebook meme based on a topsy-turvey, idiosyncratic to say the least, list of books purported to have been created by the BBC. Good fun, some nice connection and conversation with friends today…but I’m relieved to know that the list, which haphazardly includes separate entries for The Chronicles of Narnia and The Lion, the Witch and the Wardrobe, isn’t actually the list from the BBC’s The Big Read Top 100…although it’s close! A blogger broke it all down for us in her post “How Do Memes Start? 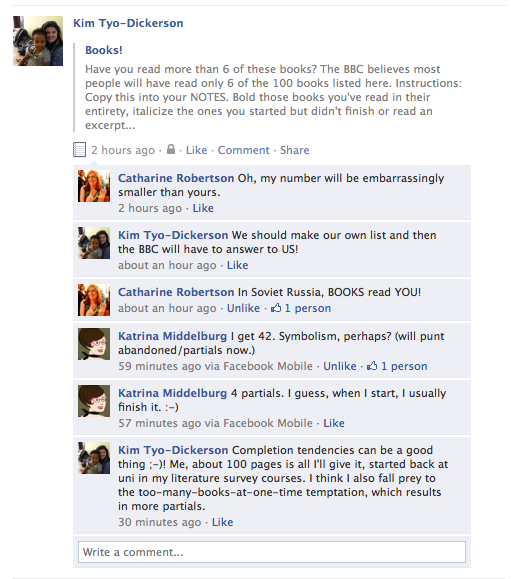 A Case Study: 100 Books in Facebook”. Here’s my Books! Note from today. Just goes to show, I will put off notes requests on FB until the moment has passed, but send me one with a list of books in a nice, round number like 100…I’ll fill it out in a heartbeat and then blog about it! Have you read more than 6 of these books? The BBC believes most people will have read only 6 of the 100 books listed here. Instructions: Copy this into your NOTES. Bold those books you’ve read in their entirety, italicize the ones you started but didn’t finish or read an excerpt. Tag other book nerds. Tag me as well so I can see your responses. Final Count: 48 read, 22 skimmed/excerpted/sampled/abandoned for whatever reasons…fun!